King's Gambit 3.Nf3 others - Chess Gambits- Harking back to the 19th century! If Black wants to really "take on" the King's Knight Gambit with 3.Nf3, then a line with an early ...g5, such as the immediate 3...g5, or perhaps 3...d6 or 3...h6 intending 4...g5, is the best way to go, while for a dynamically equal game with level material, the Modern Defence (3...d5) is holding up well. However, Black also has a number of other options which are playable. Probably the most important of Black's third-move alternatives. Black can continue with a disruptive check on h4, but this allows White to gain control of the centre as compensation for having a misplaced king, and generally regain the sacrificed pawn, so Black more commonly follows the bishop move up with ...Ng8-f6 encouraging e4-e5, and then challenging the e5-pawn with ...d7-d6. White can try 4.Nc3! ?, challenging Black to bring White's king out to e2, which is a much sounder line than the Mason Gambit (3.Nc3). After 4...Bh4+ 5.Ke2, White can get enough compensation for the dodgy king position. After 4.Bc4, 4...Bh4+ is probably inadvisable since the white king then turns out to be quite safe on f1. The most important line runs 4.Bc4 Nf6 5.e5 Ng4 6.Nc3 d6 (White's fourth and sixth moves can be transposed). Then a fairly equal queenless middlegame can result after 7.exd6 Bxd6 8.Qe2+ Qe7 9.Qxe7+ Kxe7, with Black's exposed king offsetting the extra pawn, or a combative middlegame following 7...Qxd6 8.d4 Be6 9.Bd3. 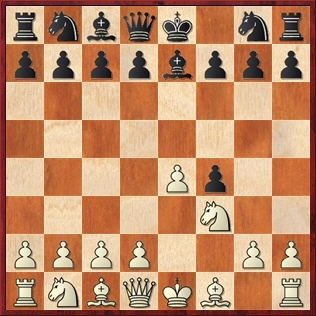 Thus if Black is looking for a dynamically equal game and isn't too bothered about holding the extra pawn, the Cunningham Defence looks like a decent alternative to the Modern Defence, but it is not a line that should deter White from playing the King's Gambit. The Schallopp Defence, 3...Nf6 , is slightly inferior since Black's knight ends up a bit out of play after 4.e5 Nh5, but it is not too bad. White does best to occupy the centre, e.g. 5.d4 d6 (if 5...d5 then 6.Be2 is strong) 6.Qe2 d5 7.c4, and White has good chances of getting a slight advantage out of the position despite the pawn minus. Interesting is 3...Ne7 intending 4...d5 (White gets enough compensation for the pawn if Black instead tries the sneaky ...Ne7-g6 holding onto the f4-pawn, by accumulating a lead in development). 4.d4 d5 5.Nc3 dxe4 6.Nxe4 Nd5 7.Bd3 Be7 is the typical continuation in this line, whereupon Black has good chances of equalising with best play, but White gets the usual attacking chances on the kingside. There are some crazier ideas including the Wagenbach Defence, 3...h5! ?, which was discussed at length in the Addicts' Corner section of the Chess Monthly magazine many years ago. Black intends to play ...g7-g5 and ...h5-h4 and thus prevent White from breaking up Black's mass of kingside pawns by playing h2-h4. However, I like White's chances following 4.d4 g5 5.Bc4 h4 6.0-0 d6 7.Nc3.